Announcement My Shop "ITEMS" has more Peyote Bracelet Patterns, Sections & Super Deals! Our FREE shipping also includes free Tracking! Our Peyote Bracelet Patterns, Brick & Loom Stitch Patterns & Tutorials are suitable for Beginner, Intermediate & Advanced Beaders and our hand-make, and unique range of ready-to-wear Earrings, Necklaces & Bracelets are beautiful. NEWSLETTER - Click: http://eepurl.com/cp8Wxf to SIGN UP & Stay Informed! Go to: https://www.etsy.com/help/article/3949 for general information. Please drop me a message at any time should you require assistance. Kindly note South Africa is some 7 Hrs AHEAD of USA time, so all emails will be answered within 12-24 hrs. Discounts & Sales are offered every month. Sign up to receive our NEWSLETTER (See Link above) and connect with me via social media to make sure you don't miss out. Enjoy YOUR shop, in MY shop! 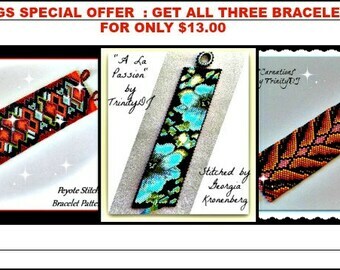 My Shop "ITEMS" has more Peyote Bracelet Patterns, Sections & Super Deals! Gorgeous pattern & great instructions! S much talent!!!! Great tutorial and VERY helpful! "Petals and Pods" - Bead woven necklace. 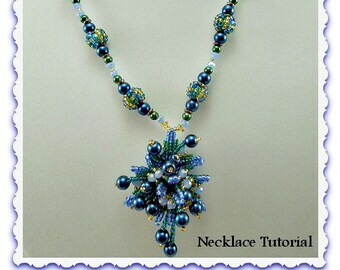 Here: Petals and Pods - Bead embroidered and woven necklace. Peyote Beaded Patterns,bead tutorials, Ready-to-Wear Necklaces, Be, Earrings and polymer clay pendants. For many years I hand-made boutique style clothes, but my life and career were set to change when in 2007, as a result of some health issues, I began making beaded jewelry as a hobby. About the same time I also met the love of my life and since living hundreds of miles apart wasn’t an option, within a few short months I moved to picture perfect Cape Town. As I slowly settled into my new home, in a city I had always wanted to live in, I found myself captivated by the beauty and serenity of the ocean and surrounded by the majesty of sun drenched mountains. Love was in the air and my new source of inspiration complete. Creation itself was providing the drive for, and expression of, my designs. This is how I progressively became ever more serious about all things beady! Hi, my name is Lorraine... and this is my story! In many aspects my business life has been a bit of a roller coaster ride but the success I am beginning to enjoy now has come from a combination of hard work, long hours, many a tear, a lot of learning and loads of tenacity. Vital ingredients for me have been the encouragement, help and advice I have received from friends, fellow beaders and especially those closest to me. It's an exciting time now, a time full of promise! From a very early age I have loved most art forms, but beadwork and making jewelry especially, because any woman wearing an exclusive jewelry piece around her neck or on her wrist, makes her feel a little more beautiful and extra special. By 2009 my hobby had evolved into a Business and I formed “Trinity Designer Jewellery” (or “TrinityDJ” has it has become more commonly known) and opened my Etsy shop from which I primarily sold ready-made bracelets and necklaces. Later my jewelry range diversified into providing beaded bracelet patterns and tutorials, suitable for beginner, intermediate and advanced beaders, all of which are well priced and available here as instant digital downloads. TrinityDJ’s design philosophy has always been about providing affordable, unique and delicate hand-crafted, high quality, ready-made jewelry pieces as well as easy to follow, well illustrated, bead patterns and tutorials. To this end, I use only the best quality beads, gemstones, pearls and findings and even the toggle clasps are custom made for each piece for easy fitting. No matter whether you are dressing up for a business meeting, a night out on the town, a wedding, an elegant and sophisticated night at the theater or just enjoying a relaxing casual day at home, TrinityDJ has a pendant, necklace or bracelet to suit YOU and every occasion. Please look at my SHOP ANNOUNCEMENT page for ways in which you can connect with me. Hope you enjoy browsing my shop and I look forward to hear from you soon. To communicate with you about New Offers. Necklace & pendant image colors may differ slightly on different screens. The color of the actual item may differ slightly (usually better) from the image you see in the shop. PayPal is the only form of payment I am able to accept. (b)	Use the PayPal site (without having to register with PayPal) to pay with your Credit Card. I cannot accept E-checks, money orders or Etsy Gift Cards! 1. All items will be shipped from South Africa by Air Mail (with a tracking number) within 1-2 working days of receiving cleared payment! 2. I cannot ship to PO Boxes within the US. 3. Kindly provide a physical address for your package to be sent to. 4. Please ensure your Physical address in Etsy matches your confirmed Physical address specified in PayPal. 5. Please ensure the address is correct, as errors cannot be rectified once a package has been mailed. Shipping costs only apply to physical Jewelry purchased. All patterns & tutorials are delivered as Instant Downloads. Shipping cost for ONE, small, lightweight item purchased will be $6.95 unless otherwise indicated in the individual listing. The shipping cost for TWO or more, small, lightweight items purchased, all purchased SIMULTANEOUSLY on the same day, will be $6.95 for the FIRST item (unless otherwise indicated in the individual listing) PLUS $4.75 for each additional item. In some instances FREE shipping may be offered on selected items and will show this in the listing. Where a discrepancy in the shipping costs occurs, the cost provided in the listing will take preference. Kindly allow 10-14 working days for delivery. I want you to be 100% happy with your purchase and I will do everything possible to ensure you receive what you ordered in perfect condition. (1) The item returned must be received in exactly the same condition as it was packaged & shipped to you. (2) The purchase price of the item will be refunded at my discretion. (3) No shipping costs, import duties, tariffs, taxes, postage or any other costs will be included in the refund. (4) Return shipping costs must be borne by the purchaser. (5) I cannot be held responsible for loss or damage incurred during shipping. Accordingly insurance cover may be advised. Kindly contact me with any questions you may have about items in my shop or shop policies. I always encourage my customers to advise me when their package has arrived because it's important for me to know (a) that the parcel reached it's destination in good condition and (b) my customer is happy with their purchase. I trust you enjoy your purchase as much as others have enjoyed theirs.